I visit Italy every summer to visit family and friends. I consume a lot of Italian food ( but I would consume a lot of Italian food even if I wasn’t Italian because it’s so damn good). I know that I’m so very fortunate to spend my summers in Italy and it’s always a great feeling when I get to bring someone I love with me to show them my beautiful second country. This summer my beau came with me to Italy for two weeks. It was not only his first time in Italy, but his first time in Europe. This was a big deal! I was beyond ecstatic to whisk him around to “my” places that meant a lot to me and that I had so many fond memories of. I couldn’t wait to introduce him to my family and friends, and most of all, I couldn’t wait for him to try the food!! After all, we are in Italy! We visited Venice, Florence, Lake Garda, and then went up north to Bolzano where my mom grew up. We took hundreds of food photos so in order to avoid a mega post I will do a series of posts of memorable meals categorized by city. 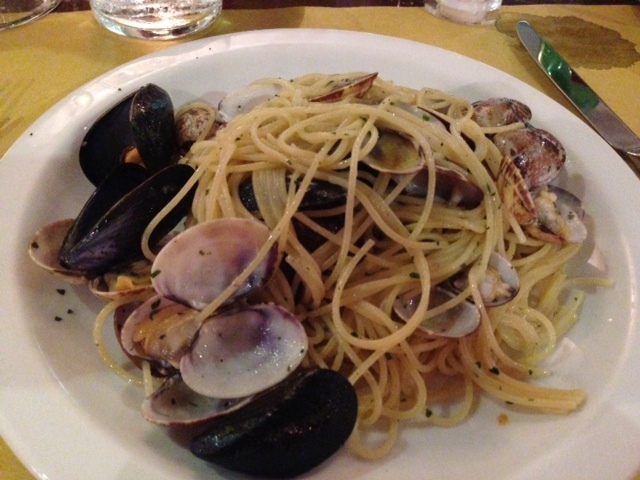 First up…..
A great restaurant in Venice that is off the beaten path is a place called Osteria Mocenigo. It’s run by two brothers, one of whom you will see running around the restaurant always in a frenzy. 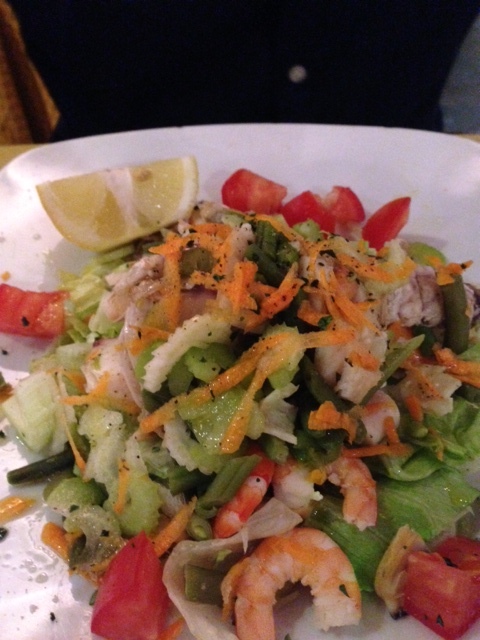 Here you will find typical venetian fare, aka tons of seafood, and it’s always freshly prepared and in a simple way. It’s a homey, no fuss restaurant that always delivers in terms of flavor and consistency. 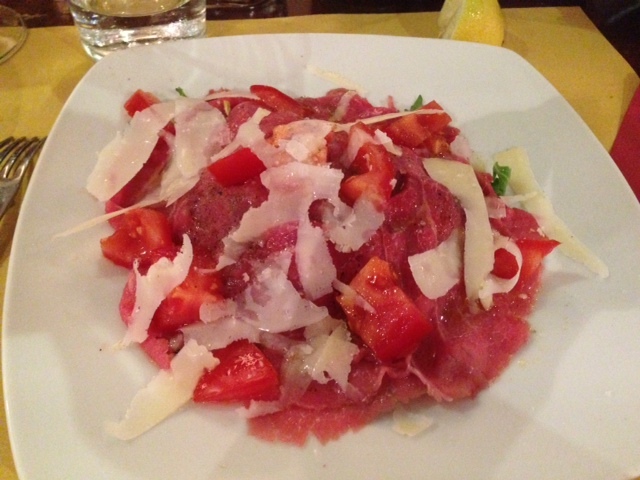 We started with a beef carpaccio which was probably the freshest carpaccio I’ve ever had. I was told it arrived that morning and it definitely did not disappoint. One thing you must know about me is that I’m obsessed with octopus. If it’s on any menu, I’m ordering it. I asked the waiter if he could just do a simple octopus salad and I guess there was a bit of confusion because what was placed in front of me was a seafood salad with all different types of seafood including shrimp, clams, mussels, squid, and yes, octopus. It was still very delicious, but I was hoping for something a bit more simple. For my main dish I had spaghetti with clams and mussels which was just the right amount of saltiness and brininess and the pasta was cooked perfectly with a nice chew to it. 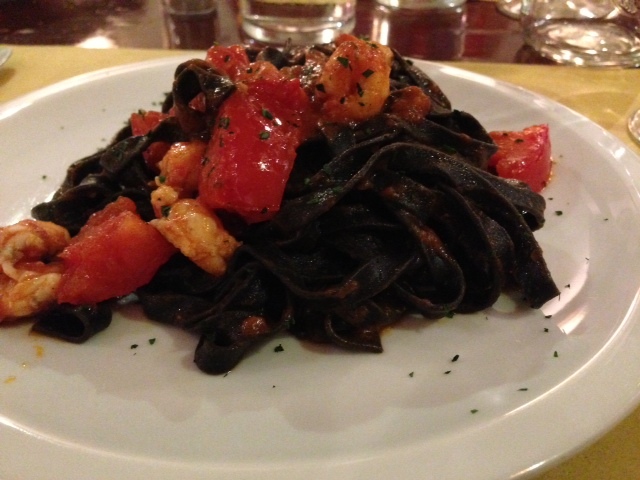 The boyfriend had squid ink tagliolini with fresh chopped tomatoes and shrimp. Another restaurant definitely worth a visit is Osteria Anice Stellato. This restaurant has consistently been ranked high on travel sites and even Venetians enjoy dining here as well. You’ll often see groups of Venetians celebrating birthday, engagements, etc. Once again, the fare is seafood, Venetian style, but each dish is simple, yet exquisite. At this point, I was on seafood overload so I ordered a nice pasta dish with eggplant and aged ricotta. This was the third time I’ve eaten at Anice Stellato and I was still impressed with the always changing menu and the diversity of the available dishes. I recommend all visitors stop here for dinner and get away from the hustle and bustle of Piazza San Marco and Rialto for an authentic, relaxed dinner. 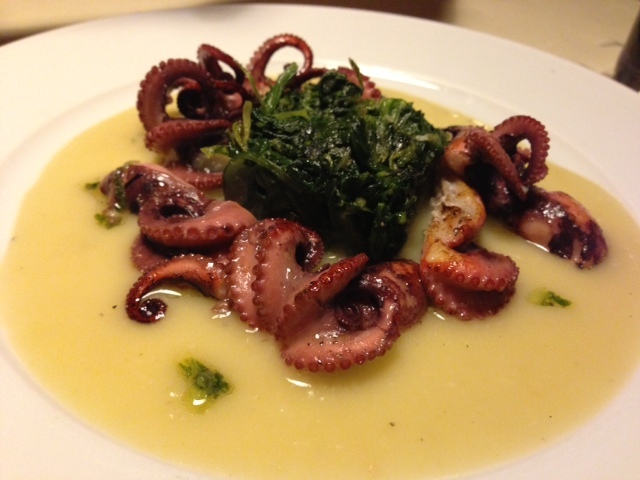 We started off with baby octopus (moscardino) which were grilled and then placed atop a fava bean puree and then topped with sauteed spinach. This dish was great, but in my opinion lacked a bit of salt. 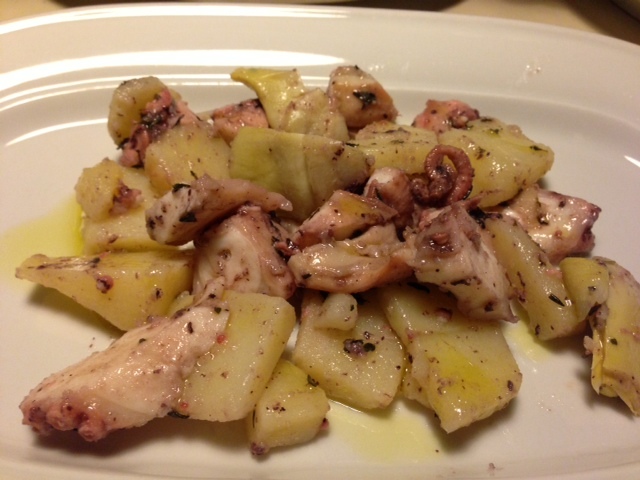 I also had an octopus salad (told ya I liked it) with potatoes and artichoke hearts. This was my favorite octopus dish of the entire vacation. I could have eaten this over and over everyday. 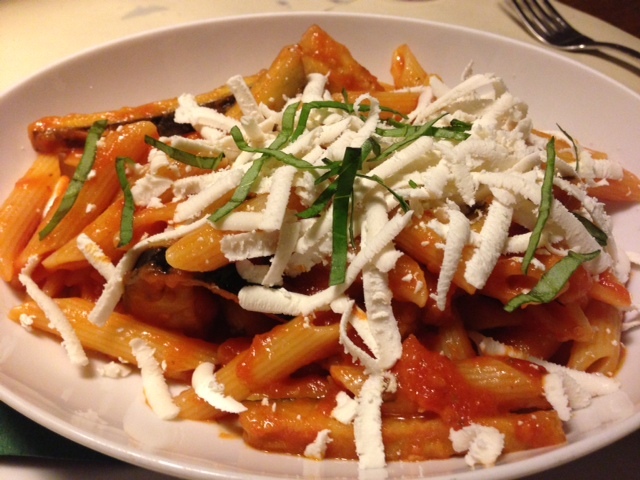 I had penne alla Norma which consists of a tomato sauce made with strips of eggplant. This dish was topped with fresh basil and aged ricotta which was a bit salty. The ricotta was just the right amount to give the dish a sharp bite and the eggplant was soft, but not mushy. Great pasta. 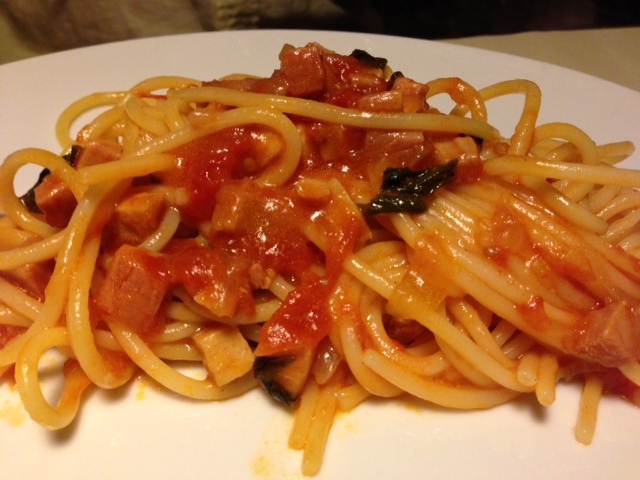 The boyfriend had whole wheat bucatini with an amatriciana sauce of tuna and smoked swordfish. Divine…. We did the obligatory bellini at Harry’s and although it was a nice experience I don’t know if I would recommend it to anyone unless you just want to go to say you’ve done it. The cocktail wasn’t anything extraordinary and we were seated upstairs because the boyfriend was wearing shorts (we had been walking around all day). If you go, make sure to go around aperitivo time (6 or 7 pm) and dress up! If you’re dressed smartly you can sit downstairs which is much better experience because that’s where the bar and all the action is. 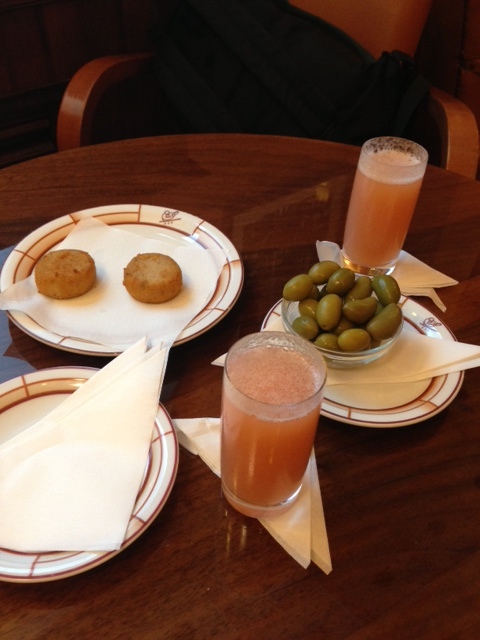 Two bellinis ran us 36 euros (about 47 dollars) but what the hell….we were on vacation! 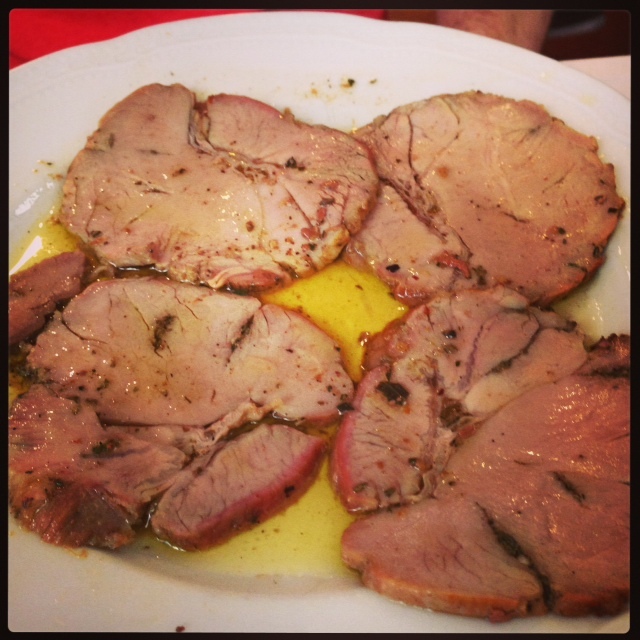 Stay tuned for my next post on Florence….here’s a sneak peek at one of the dishes that I loved….